Founded in 1995, Springs Cleaning is your "one-stop solution" for all your commercial janitorial and cleaning needs. 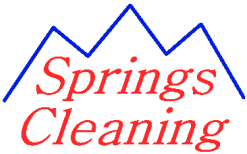 In business since 1995, Springs Cleaning is your go-to cleaner of choice in Colorado Springs for cleaning and janitorial services needs. We're able to handle any cleaning job, from building interiors to specialized sanitizing and sterilization. We offer total commercial cleaning services and are happy to come to your office, school, church or business. Whether you require office cleaning services for a large corporation or small business, Springs Cleaning is equipped and experienced to handle the cleaning tasks required for any type of office environment. Let our office cleaning service staff work with you to develop a cleaning schedule that works for you — it can be weekly, biweekly, daily or at a frequency of your choice. Our cleaning services provide discreet cleaning for both private and public areas, including floors, horizontal surfaces and ornaments. All fabric and wood furniture can be vacuumed and polished. We have extensive experience cleaning churches and houses of worship, and respect for sacred spaces and their artifacts is of the utmost concern for us. Put Springs Cleaning to work to keep your church looking it's best, whether it's traditional, contemporary, or somewhere in between. At Springs Cleaning, we understand how a population of youngsters in close proximity can pose serious challenges to good hygiene and sterility. Our school janitorial services are equipped to handle all types of school environments, from kindergarten to vocational schools.We pay special attention to high-use objects such as doorknobs and light switches and make sure to clean restrooms with routine regularity. For other commercial enterprises, such as medical facilities, funeral homes and retail stores, we have different sets of standard plans that can be tailored to your needs. Many medical facilities already have their own cleaning procedures established that can vary based on the type of practice being performed. Funeral homes may have special needs, such as requiring cleaning during certain hours and treating certain areas with discretion or special care. Retail stores have unique fixtures, displays and inventory that must be cared for gently and effectively. Beyond these types of businesses, our commercial cleaning service is ready to assist you no matter what kind of business you have to make sure your facilities are as spotless and sanitary as you need them to be. We'll Work Hard for Your Business!